Around this time of year, I always have a ton of carrots in the fridge. Now that they’ve come into season, it’s really inexpensive to buy organic (I just picked up a few pounds at the market for two bucks!). But one day I looked and had 3 separate purchases (i.e. bags) of these seasonal delicacies. So, what to do with them? My friend Celina washes and peels them right when she gets home so the work is done and they are an easy snack. Another option is roasting them to sweet submission. 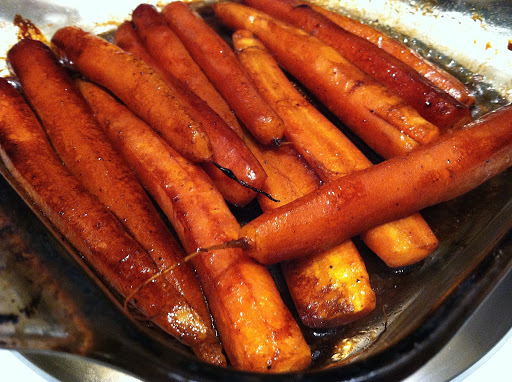 Cooking the carrots in a little balsamic vinegar will make this dish super flavorful, it’s almost like a sweet pickled carrot in 20 minutes. If they haven’t begun to blacken by the time they are done cooking, I turn up the oven to broil and hit them with intense heat right under the source for a few minutes. The sugar in the balsamic gets so sweet and smoky, you’ll wish you made more for leftovers. 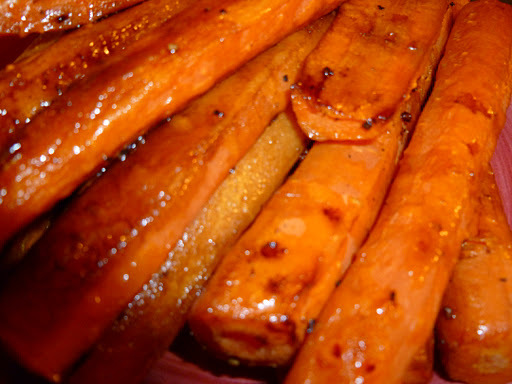 Heat oven to 450*F; on a cookie sheet or in a long roasting dish, toss carrots with oil, vinegar and sprinkle with salt and pepper. Bake for 10 minutes in the top third of the oven, then shake pan to move carrots around (i.e. allowing them to brown on another side) and bake for 10 minutes more. Carrots should be cooked to the point that a fork will pierce, but still have a bite to them. Garnish with a dash of fresh parsley and/or another hit of balsamic.